Vintage - Elizabethan English Bone China, "Swiss Cottage" Pattern, Made from 1960 through 1979, Total of (27) Pieces. This beautiful Elizabethan English Bone China of the "Swiss Cottage" Pattern by Taylor & Kent, is a designed in an exquisite 22kt Gold, on White and Cream. 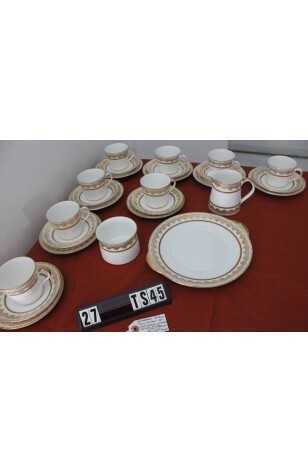 The Plates have a Cream Lip Band with 22kt Gold Filigree Lace Pattern, 22kt Gold Verge and Rims. Cups have the same Band on the Rims with 22kt Gold Handles. The Sugar Bowl has the 22kt Gold Filigree Band, and the Creamer has the 22kt Gold Band at the Base and Rim. Platter has the 22kt Gold Handles, with the 22kt Gold Filigree Lace on the lip. This very nice set would make a lovely Wedding Tea Setting. 8 - Bread/Dessert/Tea Plates - 7"